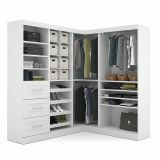 Bestar Pur by Bestar Corner Storage kit in White - Combining style and convenience, Pur by Bestar is the perfect solution to furnished condos, lofts, studios, guest's rooms and home offices. The collection brings multi functionality to a single room. 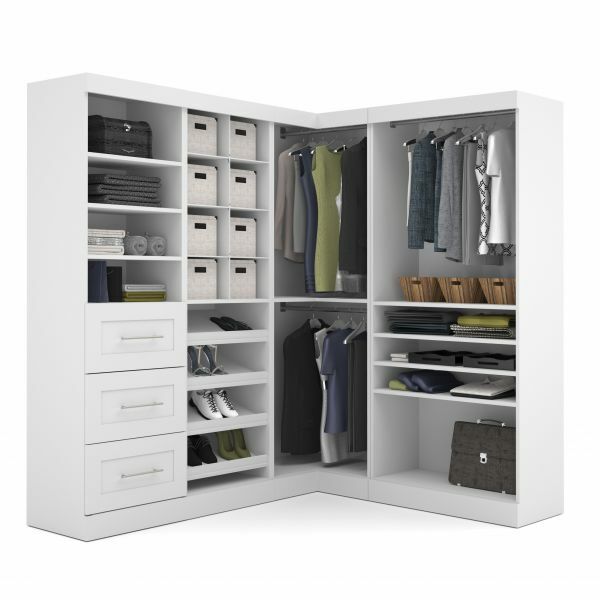 The kit comprises a multi-storage cubby, a corner unit, a 36" storage unit and a 25" storage unit with 3-Drawer set. The 25" and the 36" unit have 2 fixed and 3 adjustable shelves to maximize your options. 2 clothing rods are included with 36" unit. Drawers are mounted on ball-bearing slides for smooth and silent operation. Shaker-inspired trim and metal handles on drawers. The multi-storage unit has 8 cubby compartments and 4 slanted shelves. The corner unit has 1 shelf and 2 poles to hang clothes. 36'' storage unit : 35.8 x 18.2 x 83.7. 25'' storage unit : 25 x 18.2 x 83.7. 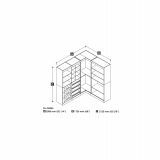 Multi-storage unit : 25 x 18.2 x 83.7. Corner unit : 32.3" x 32.3" x 83.7".